"We have millions of users around the globe who do amazing things with our technology every day," said Esri president Jack Dangermond. Redlands, California—More than 16,000 people from 120 countries around the world are expected to converge in San Diego, California, to discuss the power of maps and applying geography at the 2015 Esri User Conference (Esri UC). The Esri UC and related events will take place from July 18–24, featuring a variety of speakers from a presidential candidate to global first responders. Attendees will share ideas and best practices for improving our world through maps. 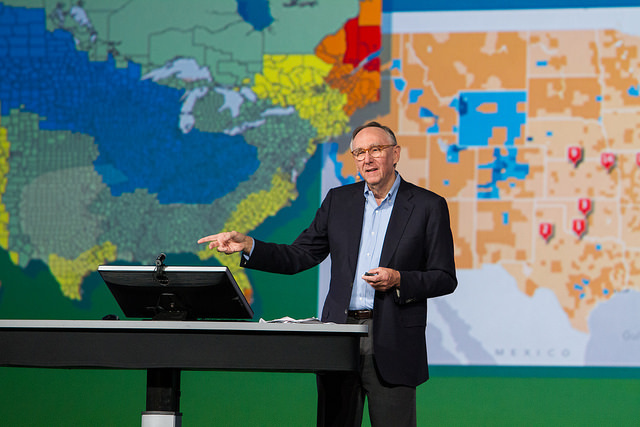 "We have millions of users around the globe who do amazing things with our technology every day," said Esri president Jack Dangermond. "The User Conference is our opportunity to recognize their important work, learn from them, and empower them with even better tools and techniques to continue their mission." Other featured speakers will include operations staff from Hartsfield-Jackson Atlanta International Airport, executives from JPMorgan Chase, the director of Strategic Cooperation at the International Centre for Integrated Mountain Development (ICIMOD), and the president and CEO of the National Geographic Society. Former Maryland governor Martin O'Malley headlines a list of innovators from across every industry who will demonstrate how geospatial technology can make government smarter, combat global health challenges, ensure public safety, and drive greater revenues for businesses. With a full week of activities, the 2015 Esri User Conference is shaping up to be the biggest yet. Before the Esri UC even kicks off, a series of concurrent events related to business; education; national security; architecture, engineering, and construction (AEC ); and 3D mapping will take place July 18 and 19 in and around the San Diego Convention Center. These focused events will give attendees a deeper dive into various functional areas and equip them with an action plan to immediately invigorate their own organizations. Throughout the week, more than 1,000 users will deliver presentations detailing how GIS helps their organizations in a number of ways. Whether they're onstage for Monday's Plenary Session or leading one of the nearly 300 moderated paper sessions, speakers will share lessons learned and best practices that can help their peers succeed. The National Geographic Society will be on hand to continue celebrating the organization's 100 years of making maps. A chronicle of the history of maps and the American presidency, from future President Dwight Eisenhower carrying maps into battle during World War II to President Barack Obama receiving official presidential maps in the White House, will present the art and science of where. Gary E. Knell, president and CEO of the National Geographic Society, will also speak at the Plenary Session about the importance of geography in science, technology, engineering, and mathematics (STEM) education. From hundreds of expert-led technical workshops to the expansive GIS Solutions EXPO featuring more than 300 technology companies and start-ups, attendees will immerse themselves in the latest and greatest in mapping and spatial analysis. Attendees will find a range of demos, talks, and resources about hot topics—big data, 3D visualization, unmanned aerial vehicles (UAVs), and more. The Esri UC and related events will span seven days and offer opportunities for both technologists and managers to understand how geography can be applied to every organization's challenge to drive better outcomes. For more information, visit esri.com/uc.